Google Voice, Google’s VoIP telephone service, launched in 2009 and is now a popular service used by millions of people. But will it work for business calls? Here’s what to know about Google Voice that can help you decide if it will work for your small business. Google Voice acts as one number that can work for all your phones, so that you aren’t tied to one device or location. The service offers call-forwarding, voicemail, and messaging among other features, and is free for most U.S. and Canadian calls. (Those that aren’t free cost 1 cent per minute in the U.S.) For small businesses or sole entrepreneurs, it also means an easy and inexpensive way to give your business its own phone number and have those calls forwarded to your personal phone(s) and/ or smart devices. There are a few reasons why, at least for business use, it’s a better idea to use a number that Voice assigns you instead of porting one in. For one, Google Voice will not port in a landline or VoIP number. Voice also won’t give you a toll-free number – if you want one, you can port it in, but it would have to be a mobile phone number. Voice charges $20 to port a number into the service. 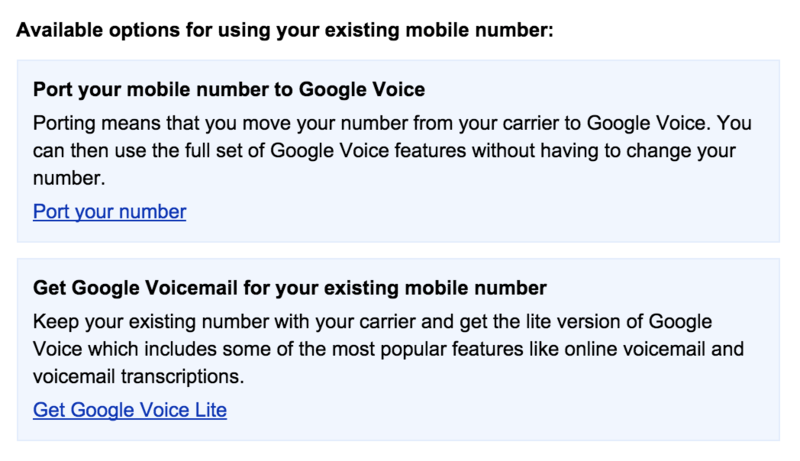 Google Voice lite, shown here as an option, is a voicemail-only plan. If you choose that, you have the same voicemail for all your mobile phones, and can set up personalized greeting, get voicemail transcriptions, and share voicemail messages. Most Voice users choose to use the feature that allows you to automatically forward calls to another phone number. For instance, your business phone number may be your Voice number that’s forwarded to other devices linked to that account. Alternatively, you can receive calls directly on a device – including a tablet, smartphone or computer – as long as it’s signed in to Google and turned on. 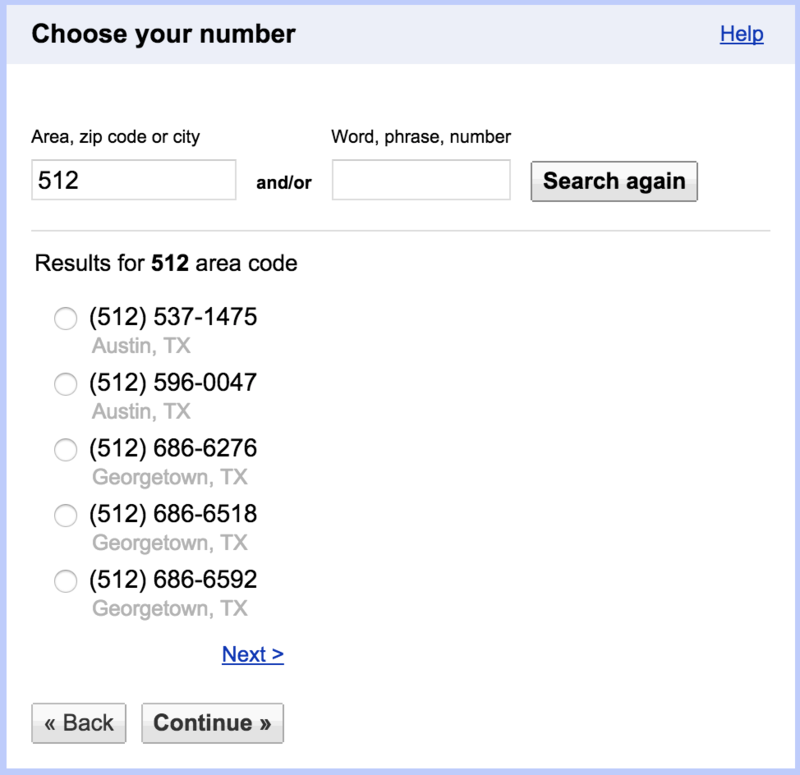 It’s worth noting that Google says you can set up to six phones to ring when someone calls your Google number. Google will charge you $3 to port a number that it’s given you out, should you choose to discontinue the service. But that fee is waived if you ported your number into Google Voice to begin with. Like many VoIP providers, Google Voice includes voicemail transcription, the ability to set up a personalized greeting, block callers, screen callers, and share voicemails, SMS to email, a mobile app, and merged calls. If you choose to get an assigned number when you sign up for Voice, you can have that number forwarded to multiple phones – or, you can customize certain callers or calls received at certain times to go to select devices or phones. For businesses that can’t miss a call – like Realtors or insurance agencies – forwarding calls to all your employees or to whatever device is with you means you are less likely to miss customer calls. If you’re a sole proprietor and can’t take the time to handle high call volume, Google Voice’s voicemail transcription will send voicemail messages straight to your business email address, which streamlines the process of responding to callers. Voice’s screening also lets you see who is calling, and choose whether to answer or send the call to voicemail. While Google Voice’s features make it a great tool for individuals and some small businesses, there are many limitations. The biggest one is that it’s difficult for more than one person to access one number, since Voice is linked to one account. As mentioned above, a Voice number can be forwarded to up to six phones, but if several people are accessing the account and the messages, things can get tricky. Only the account holder can log in to check messages or change settings, for instance. Voice is designed for individual use, so while it’s possible to use it for more than one person, your business will not have a lot of features to work with. Unlike virtual PBX services designed for businesses, Google Voice won’t, for instance, include features like user extensions, an auto attendant, and accounts for multiple users. It is technically possible to have up to three Google Voice numbers, but you have to set them as “mobile,” “home,” and “work.” As this entrepreneur discovered, setting up multiple Voice numbers isn’t always a straightforward process. Another potential snag to be aware of is the fact that Google buys phone numbers from Tier 1 network providers, and reuses numbers when they’re given up by former users. That means you could potentially have people still trying to reach the last user of your new Voice number. Finally, there’s no direct tech support for Google Voice. There is a troubleshooting section on the site, and a help forum, but no direct phone or email support. In conclusion, Google Voice can be a great tool for a business, but it is probably the best fit for a sole entrepreneur who wants a professional number and the assurance that client calls won’t be missed.